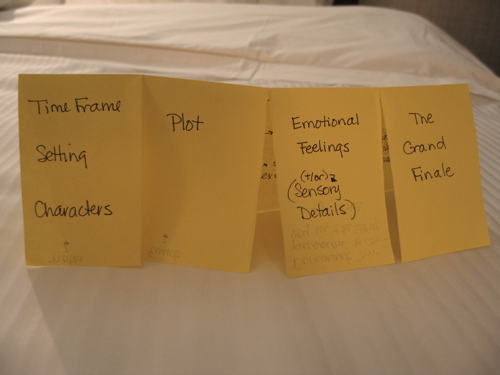 On this page are photos of the 3-D graphic organizers I made in the session I mentioned in one of the earlier posts. This one is for descriptive writing. IN the center is a photo of whatever is being described. On each color of paper is written a different category of adjectives. (Things seen, heard, felt, etc.) The students who had used it referred to it as a flower. This one is for persuasive writing. The squiggly lines would actually be sentences written around the bottom of each piece of the pyramid. 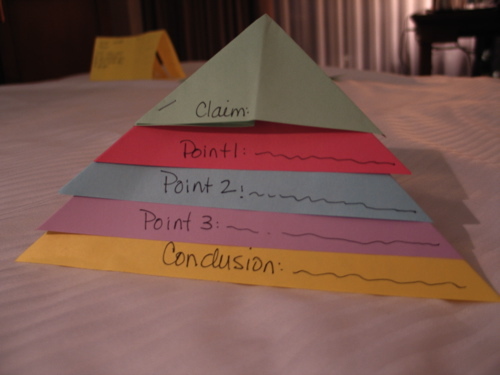 Here’s a late-breaking idea, developed while talking with a fellow teacher on the plane home from Seattle: In order to demonstrate the importance of transitions between paragraphs, you could poke a hole in the top of each pyramid. Thread a piece of cotton string through the whole thing, tying a knot at the inside of each pyramid and leaving several inches of string between them. They could still stack, but if you picked it up by the string, it would be a hanging thing. On each string separator you could attach a piece of paper with some sort of transition sentence example, so the student would remember to write one. I wonder if that makes any sense. If I actually try it, I’ll post a photo of what I mean. This one is for teaching the research paper. 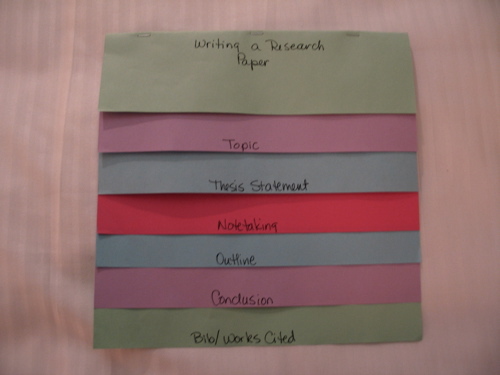 Each little flap explains a portion of a research paper. It is not meant to actually structure the paper, as much as to teach how it goes, and what the important points are in structuring it. The idea is that the organizer is a tool the student takes on to other classes in the future. This last one is for structuring a narrative. The important parts are on the outside, and on the inside the specifics of the narrative are written. From this the writer would go on to put together their story. I would probably make each of these a little smaller, to use less paper. I think that for English Learners and young children (even older children, actually) they provide a physical manipulative which gives thinking time as well as guidance to structure. I might even have students illustrate them if there was time, as using the other side of the brain is important to developing ideas. It’s too bad we have so little time for this sort of thing in our assessment-driven educational arena today. We made these to sort out some different ways in which text is organized. We read the info text in McDougal Littel on the subject, and made these little books to keep track of the information. I think I’m going to need to do something like this for my ninth-graders. I just read their practice SOL essays this evening, and OH MY, we need some work. Hi. I really like your samples. I am researching for my Master’s thesis on manipulative graphic organizers. Do you know of any research that has been done in this area? I don’t know of any other sources for you. I just make them up as I go, although I didn’t even make these up. I wish I could help! I realize this is 3years later, but I am currently creating a set of manipulative GO’s working as a literacy coach with teachers, and have begun writing a book (my fourth book on differentiated instruction) on how to manipulative graphic organizers in comprehension instruction and interested in your work on this. I know that there is a comparison of two classes using 2-D vs. 3-D GO’s in Best Practices in Literacy Instruction by Morrow, Gambrell and Duke (4th ed., 2011) stating the benefits of the manipulative approach. You have probably finished your Masters now, but I am willing to share any ideas and would appreciate your sharing any classroom-based research. I’d be happy to communicate with you about this topic. I have finished my Masters, I finished it in 2006, but it was not about this topic. I just like to have my students create manipulatives with their work – I think it help the information sink in when they access a different area of their brain. Interestingly, my current students who have been in school ever since NCLB and all the bubble tests were implemented are not all that interested in creating or using organizers or any sort of arty project. They groan if I ask them to do something in color. It’s sad, and a testament to the numbing effect of the test orientation of our schools today. Thank you for replying to the post. It is indeed sad when we have a generation of ‘stop-watch’ readers and test-takers who find no intrinsic motivation from delving deeper into their own responses to literature [and life]. You are right to persevere with manipulatives, they certainly require students to process information through multiple windows to the reading/writing brain. I think that is why they groan – it actually takes more mental energy to represent a concept visually than a test prep worksheet. I am currently creating a set of 3-D manips for comprehension and writing, as well as GO shapes that students can use to create their own mind maps, aligned with specific metacognitive strategies and literacy skills. Perhaps I could send you a copy of the masters and photos when I complete them to an email address, if that is permissible. I would appreciate any further photos of your students work so that we can both expand our repetoire that way. I would not use the photos in any published form without your permission. You have my permission to use my email address for any correspondence. I am interested in using the 3-D pyramid with my students. 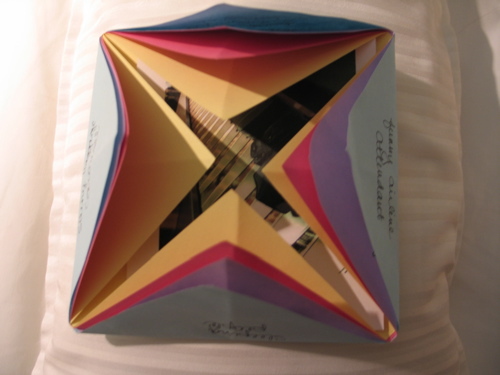 I’m wondering if there is a template or a suggestion on how to make the foldables. Yes Sara, I can make a template. I believe made a square of a piece of bond paper, then folded it on the diagonals. Then I folded one of the triangles in half and that created the pyramid. Does that make sense? I’ll make one and post pictures of how to do it if that doesn’t make sense!